Although most wedding photographers out there today primarily use professional digital “full-frame” cameras, some of them (like me!) still love the beautiful and full-of-character beauty that film photography offers. Since it’s a topic I hear come up in my discussions with couples fairly often, I wanted to better explain a few of the top benefits film wedding photography provides, especially since I also shoot with digital! There’s just something about film wedding photos that simply make them romantic and timeless right from the time they’re captured. No filters or drastic editing needed here! Film photos are often described as “painterly”. It tends to have a more “creamy” smooth look, as opposed to a super-sharp more “crispy” appearance that digital photographs have. Part of the reason for this is because of the chemical reactions in the film material vs the pure digital effect of a digital sensor. Primarily, digital cameras deal with zeros and one (0,1) which is what makes them digital. Whereas film cameras are analog, that is, they capture a huge range – everything between the zero and the one! So there is more detail, virtually infinite detail! When compared with digital, film has the ability to retain more minor color difference, especially in the highlights. For example, distant hills will often retain the atmospheric blue while digital tends to lose some of the fine color transitions and detail. These fine, subtle details are very difficult to reproduce via digital, and everything but impossible to reproduce when handling many photos at a time. Often, you will notice how much more “washed out” a digital image looks when compared with film. Shooting film allows me to create fun, beautiful and nostalgic photographs that won’t ever look dated or temporarily “trendy.” Film photographs also have a stunning range of colors, tones and dynamic range that is hard to beat, especially for outdoor ceremonies with harsh sunlight. Simply put: when you hire me as your professional film and digital wedding photographer, you’ll receive photos that are gorgeous, well-balanced and won’t ever go out of style. To create gorgeous and high resolution film images, I currently use 645 (refer to the dimensions of the film which is 6cm X 4.5 cm) medium format camera (which is basically just a way to describe how big the film is). 6X4.5 negatives are three times the surface area of a 35mm film frame as well as three times the size of a typical professional full-frame digital camera. This means that using medium format cameras, in particular, allows me to capture very high-quality images with interesting perspectives and outstanding depth – all increasing my ability to create an image that is visually intriguing to the eye. I love to create beautiful, natural images that move my viewers to feel in awe when they see the subject in the photograph. Many film wedding photographers focus on accurate, lush, healthy, and “natural” looking skin tones to help create this effect. Likewise, for me, the priority is to have a well-lit image that allows for pleasant color to your face, especially. My philosophy, which I believe I share with many others in the film wedding photography community, is to bring the focus on the subject in a very beautifying yet natural manner by focusing most on skin tones and then creating color balance within the image. Film developed by professional equipment and labs gives an amazingly beautiful production of skin tones that is often very difficult to replicate with digital. Moreover, digital film tends to lend itself to greater use of on-and-off-camera flashes, which under some conditions, produce unflattering “oily” and “shiny” skin tones. I work hard at avoid this effect when shoot digital, but it is simply part of the current technology – which film altogether avoids! With digital cameras, photographers can get carried away with snapping hundreds of photos without a whole lot of strategy involved. While this process can provide many great images in the end, it also means there are many not worth keeping at all. The benefit of using film is that I’m able to shoot with a documentary style that is intentional, deliberate, and thoughtful, rather than accidental or by happenstance. Consider by contrast what an amateur photographer might do – which is to snap a lot of photographs using digital cameras, then cross their fingers hoping something good came out. This is not the way I will photograph your wedding! Film cameras help me avoid that random and risky approach to wedding day photography. Successfully using film cameras requires a lot from a wedding photographer. There are a few vital skills and bits of knowledge you need to have in order to create beautiful, print-worthy film images. These include things like film speed, focal length, exposure, composition and lighting situations — all combined in-camera without the ability to see a preview on the back of the camera after the image was taken. In short, using film helps me hone my photography skills and makes me better at my craft, even when I switch to digital back-and-forth throughout the day. Weddings can be pretty fast-paced events. This is where having digital cameras alongside my film cameras is extremely handy. The setup time and setting adjustments can be far quicker in a digital camera than film, and I don’t want to miss any details you’ll love to look back over years from now! A few other dangers of only shooting in film? Not only can the film itself potentially get lost in the mail on the way to the lab, but film cameras are (in general) older and can break without the photographer even knowing it until the film comes back. By having digital cameras with me, I’m able to provide extra security for your wedding photos to make sure your images don’t get lost or damaged. And especially for wedding receptions with limited amounts of lighting, my full-frame digital cameras can more easily capture low-light situations using “fast lenses” that have wide open apertures. That way you know your wedding photographer can shoot in low-light! 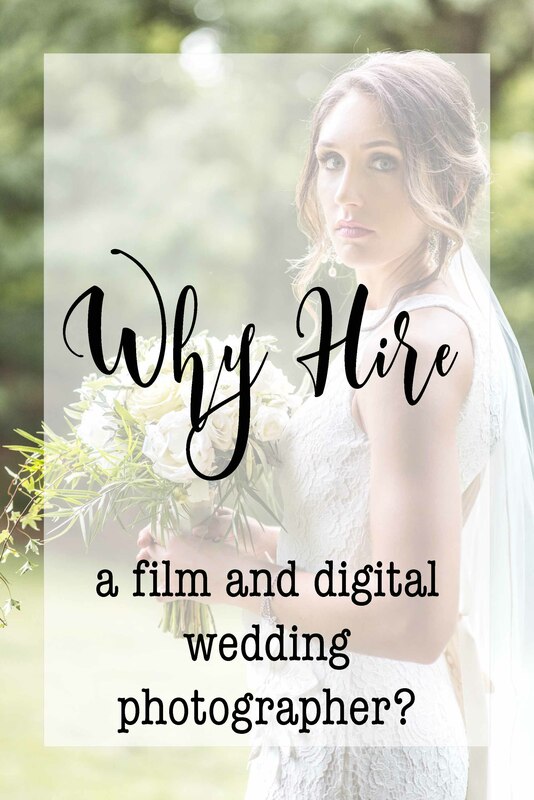 So why hire a digital and film camera wedding photographer? A photographer shooting both film and digital has a very capable choice of equipment to capture the full-range of lighting situations, from bright harsh light, to dimly lit receptions, creating the most artistic and breathtaking photographs for your wedding.